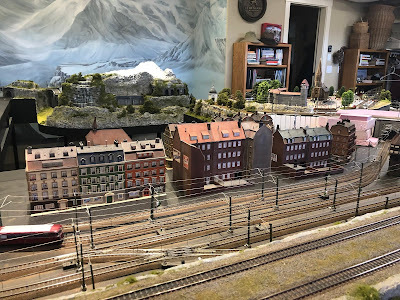 Euro Rail Hobbies and More Blog: Complicated Shuttle Route From Bahnhof to Kirche Platz. Complicated Shuttle Route From Bahnhof to Kirche Platz. Hello all....time for a fresh post. Let's explore some various methods of train control involving signals, contact tracks and circuit tracks on a two way route to and from the Bahnhof and Kirche Platz. 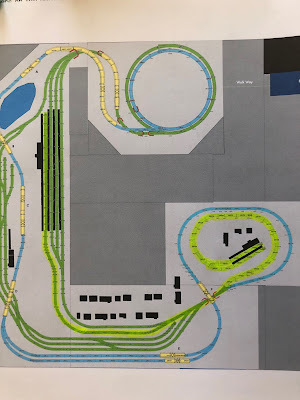 Below is shot of the freight lanes, the mainline, and the shuttle route. The Shuttle route is the second track from the left. 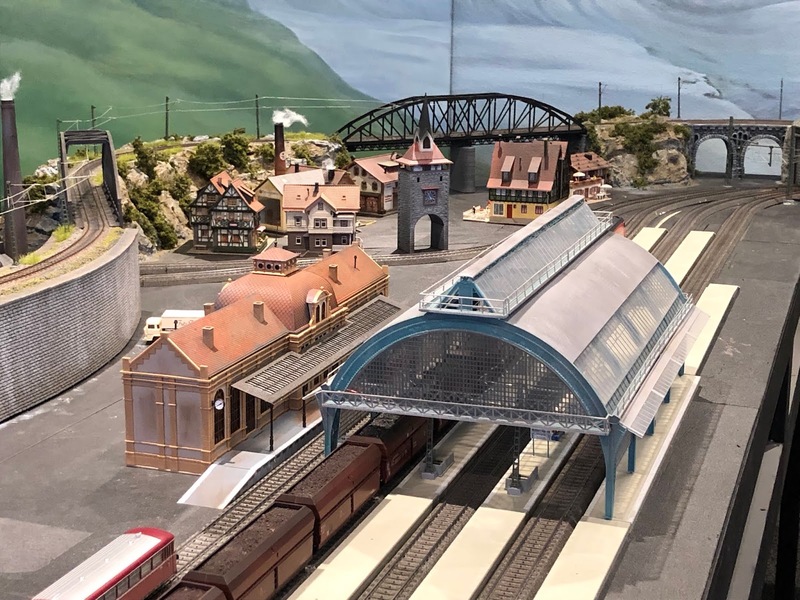 TO 21 ( located to the left of the control tower) merges the mainline and the shuttle route to the Kirche Platz. The C track has been weathered but not ballasted. 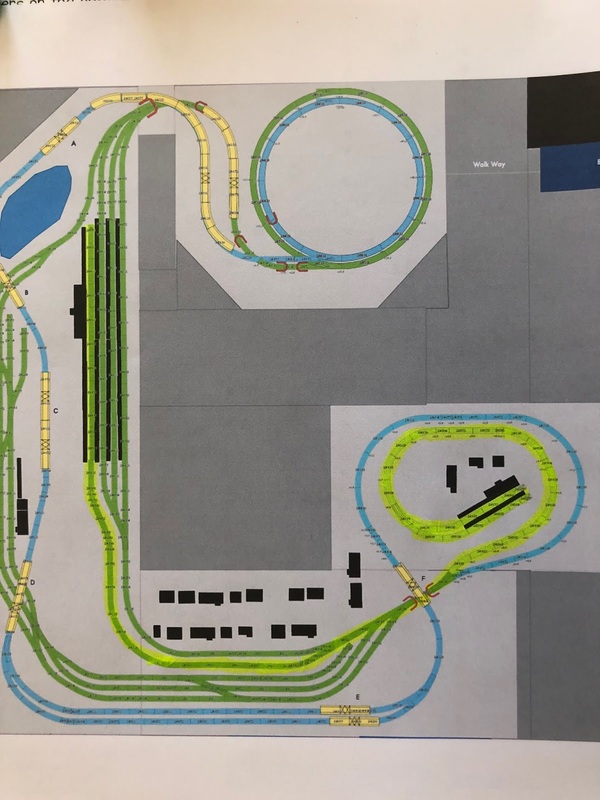 Warning....do not ballast the track until the "train control" bugs have been entirely eliminated. The Shuttle train emerges from the left, having exited the Bahnhof. The Bahnhof, with the Shuttle route on the extreme left of the four lanes. - Easy to make with C track. - For one way traffic, one can control "entry" and "exit" scripts. ( The contact track is "downstream" from the signal and the stop track( which precedes the signal)... see multiple Digital Newsletters. 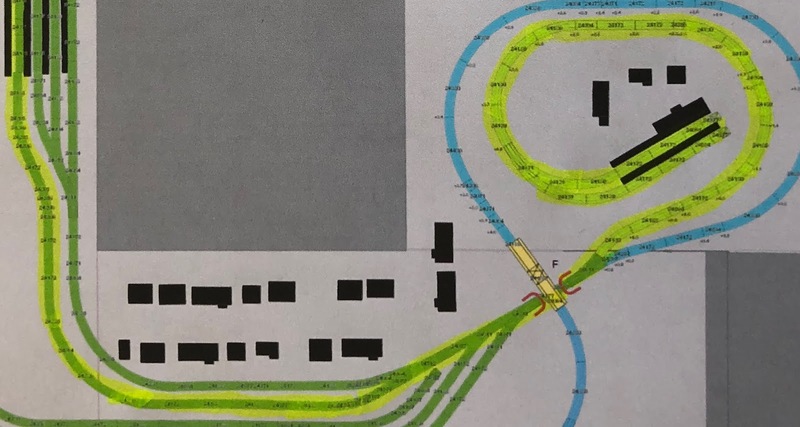 - If one uses CT's ( Contact Tracks) for two way traffic be aware that a loco going in either direction will trigger the CT ...ie. the same result via the S88 regardless of the direction of the train! - The CT's are invaluable to show occupancy on a track, because they are NOT MOMENTARY but "constant current" while activated. 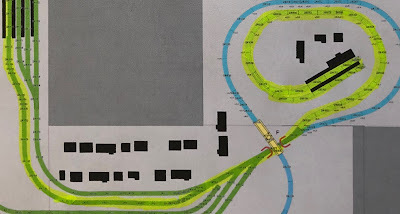 - CirT's ( Circuit Tracks) are well suited for two way traffic train control. - Each CirT can control two "functions" ..i.e, activate a signal and close a turnout. - Easy to install and connect to the S88. - Require a magnet attached to a loco ( e.g.) to activate. - Instruction pamphlet states that a Reed Contact can only control ONE solenoid. - Reed Contacts are activated in BOTH directions! In sum, if one wishes to control traffic in both directions, the best apparent choice would be a circuit track. Please note that I certainly am not the final authority on this topic, but after struggling for several weeks to resolve my shuttle route the application below works! Please refer to this diagram if you wish to follow the route control script by script. 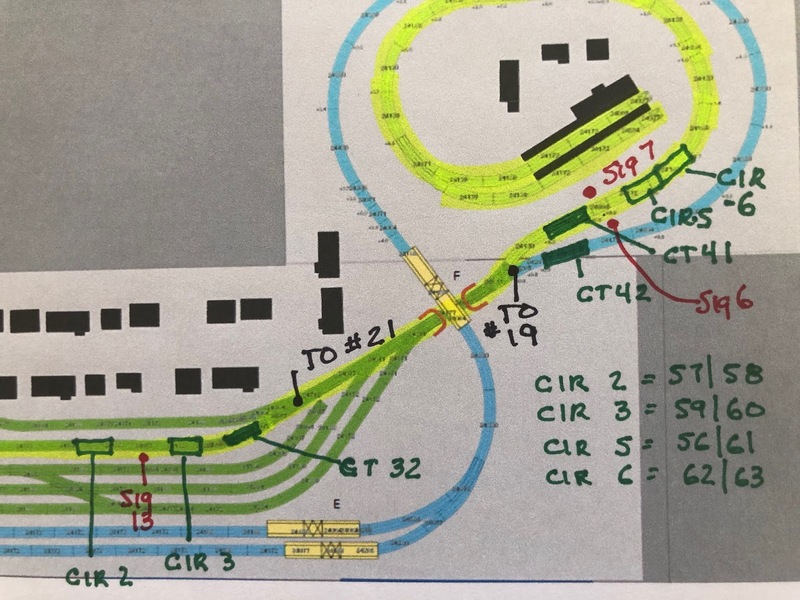 Below the track diagram is the script sequence if anyone should be interested. - MANUAL RELEASE--with Signal 13 --> Green with mainline is clear. --> - Sig 7 --> Green....allows entry into the ascending lane to the Kirche Platz. CirT 62 - Sig 7 --> Red.